Director – Cyril Endfield, Screenplay – Cyril Hume, Hans Jacoby & Shirley White, Producer – Sol Lesser, Photography (b&w) – Karl Struss, Music – Paul Sawtell, Art Direction – Walter Keller. Production Company – RKO Radio Pictures/Sol Lesser Productions, Inc.
Tarzan finds Joey Martin, a young white boy living among the natives, and brings him back to the treehut. They are visited by a man claiming to be Tarzan’s cousin Oliver Greystoke. In reality, this is an impostor Edwards, who is accompanied by Rokov, a Communist agent who killed the real Greystoke. They persuade a reluctant Tarzan to take them on an expedition into dangerous Wazuri territory to obtain the plentiful diamonds there, which they claim are needed for the British war defence. Tarzan’s Savage Fury was the fourth of the Lex Barker Tarzan films. 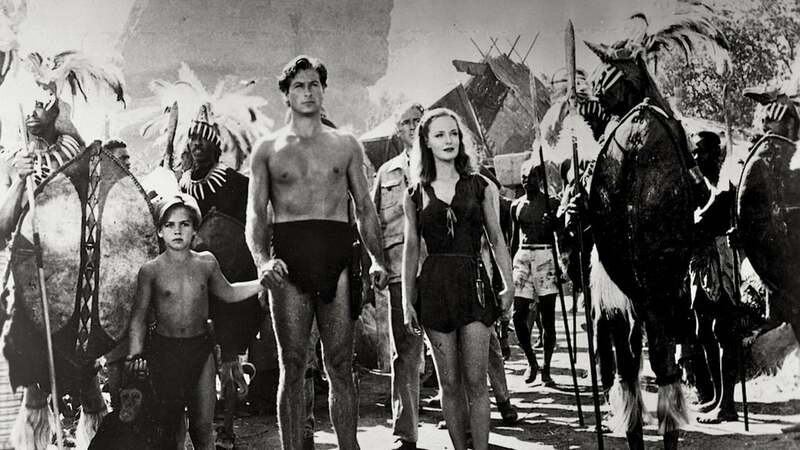 Barker, Johnny Weissmuller’s successor in the role, had previously appeared in Tarzan’s Magic Fountain (1949), Tarzan and the Slave Girl (1950) and Tarzan’s Peril (1951) and subsequent to this would make his final appearance in the loincloth in Tarzan and the She-Devil (1953). The plotting is as formulaic as it ever was in the Tarzan films – greedy white men come to the jungle and seek to trick/kill Tarzan because he knows the hiding place of ivory/diamonds/gold; Jane and the explorers are made prisoner by the natives who live in dangerous/forbidden/uncharted territory; Tarzan fights wild animals and fierce natives to save everybody. The action scenes are unexceptional, again making use of animal stock footage, most notably in the scenes with the water buffalo overturning the rafts and where Tarzan faces a charging rhino. There are one or two minor points of interest – one is the introduction of Tommy Carlton in his one and only acting appearance as what would appear to be an attempt to reintroduce another Boy to the series, although the character of Joey did not catch on and was forgotten by the time of the next film. The other is that the villain Rokov (Charles Korvin) is explicitly tied to the Communist menace – although the word Communism is never mention as such, we have a scene where he calls Patrick Knowles ‘comrade’ during the early scenes and he is working in the service of an enemy foreign power. One other point is just how much the film jumps aboard the big Biblical revival that was sweeping America with Billy Graham’s crusades in the early 1950s. This is not so subtly denoted in the scenes visiting the treehut where Tarzan was raised where he tells how he learned to read from a Bible and the end scene where a native chief refers to it as a “good book” in his pidgin English. This also becomes one of the very few Tarzan films between the first Tarzan of the Apes (1918) and up until Greystoke: The Legend of Tarzan, Lord of the Apes (1984) to reference Tarzan’s origins (as an abandoned infant who was found and raised by apes) as laid down by Edgar Rice Burroughs. One’s suspicion is that the origin story was eliminated by the Weissmuller films on the grounds that it was either too technically difficult or costly to create convincing ape costumes. Here it is at least mentioned – we have a cousin who bears the Greystoke title who is killed in the first scenes whereupon Patrick Knowles subsequently poses as that man in order to get Tarzan’s aid. Elsewhere Tarzan confirms to young Tommy Carlton that he is an orphan and later they visit the abandoned treehut where the infant Tarzan was raised. Though he had trained as an actor, Lex Barker was never as animated in the role as Johnny Weissmuller was (even though Weissmuller was an Olympic swimmer and did not come from an acting background). However, by this point, Barker has settled in and is not as stiff as he was in his earliest performances. Dorothy Hart gives her one and only performance as Jane but is eminently forgettable in the role. She seems just an average Hollywood starlet and fails to do anything to suggest someone who is living in the jungle as opposed to a contemporary 1950s housewife making home out of Good Housekeeping. Tarzan’s Savage Fury was the seventh film from Cyril Endfield, also billed as Cy Endfield. Endfield has made a couple of the Joe Palooka films and specialised in B-budget crime thrillers. Endfield had his greatest success with the colonial adventure film Zulu (1964). He made a couple of other genre entries with the Ray Harryhausen Jules Verne adaptation Mysterious Island (1961) and the troubled Marquis de Sade biopic De Sade (1969).